I'm off to Glastonbury this week and I'm really looking forward to it. Having nearly missed out on the ticket sale, we [the other half and myself] settled for combined coach and festival passes. Not the end of the world you might think, but it does mean that everything you need for the six days must fit into a rucksack and be light enough to carry. Tent, sleeping bag, a few bits of food, wet wipes and clothes sorted. But what about the beer? No room for beer - what with it taking up masses of space and weighing the equivalent of a small elephant! Well, that isn't quite true. I do have four cans of Spitfire and four cans of cider for the other half. With the weather forecast looking promising though, that won't be nearly enough! The festival has a real ale tent that I'm planning on checking out. I can't find the beer listing for either this or previous years but there must be a decent selection if they've dedicated a whole tent to it! Right? Smaller and standard bar areas are said to sell ale as well as lager and there's even a tent themed as an English Pub: "The Avalon Inn: Glastonbury’s first spit and sawdust, half timbered, old English pub. Real ale, cider or even a cup of mead served by a buxom wench with storytelling, musicians, magicians and wandering buskers." I've been to festivals before, including Glastonbury, but I've never been and paid attention to the beer that's on offer. Of course the focus will be on the music, people and good times but if there's a few decent pints along the way then all the better! There's still a couple of days before the big off, so does anyone have any tips or recommendations? 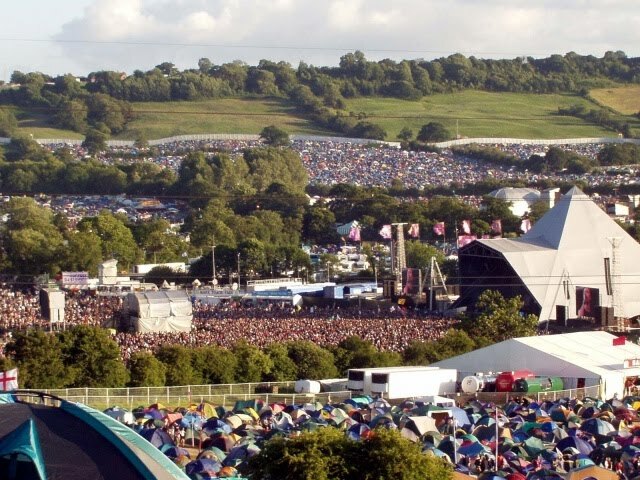 Experience has taught me that Glastonbury is a festival like no other, the sheer size and diversity means that asking fellow festival goers for their top finds is always a good idea. It's the only time and place where I drink cider, sat on the knoll, outside the cider wagon. Couldn't dream of trying anything else. No, you're right. There's a definite cider slant at Glasto and I'm sure I'll indulge in one or two. The other half is a big Brothers fan and has been since they were tiny, I'm sure we'll be spending a fair bit of time at their bar! As far as I remember, the normal bars do Woodfordes Wherry, and the ale tent did a few Adnams beers, a couple of Oakhams and some others, about 12 in all. There is also the Bimble Inn, in the teepee field, who have one or two small brewery beers in casks on the bar, cheaper and less packed in there too. I don't remember much about the beer at the Glastonburies I went to. The Psychedelic cider bus featured heavily though. 12 or so beers on from all over the place on all the time. The lineup is never shabby and the festival site is beautiful as well! Yep, Woodforde's Wherry on gravity in all the bars when I was last there waaaay back in 2004 too. I drank lots. Woodforde's Wherry doesn't sound too exciting but I'd pick it over macro lager. I thought there'd be more west country representation. Sorry, meant tipi, I have a mate called teepee though hence the confusion. If we're mentioning great festie/beer combos for future refs then allow me to trump your End of the Road with Off the Tracks, Pete.